Travel Insurance. It’s reassuring, especially if you’re indulging in a spot of white knuckle winter sports. This banner for first direct Travel Insurance encourages skiers to add First Directory to their account and take advantage of free annual travel insurance that includes winter sports cover before they travel. Before you apres ski, get first directory. 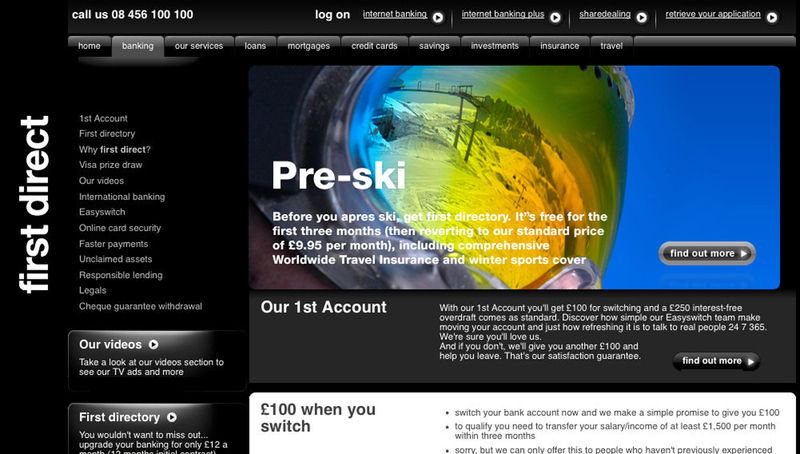 It’s free for the first three months (then reverting to our standard price of £9.95 per month), including comprehensive Worldwide Travel Insurance and winter sports cover. ®Registered Trademark of HSBC Holdings plc. Simon Anderson trading as SIMONAND Licensee of the Trademark.